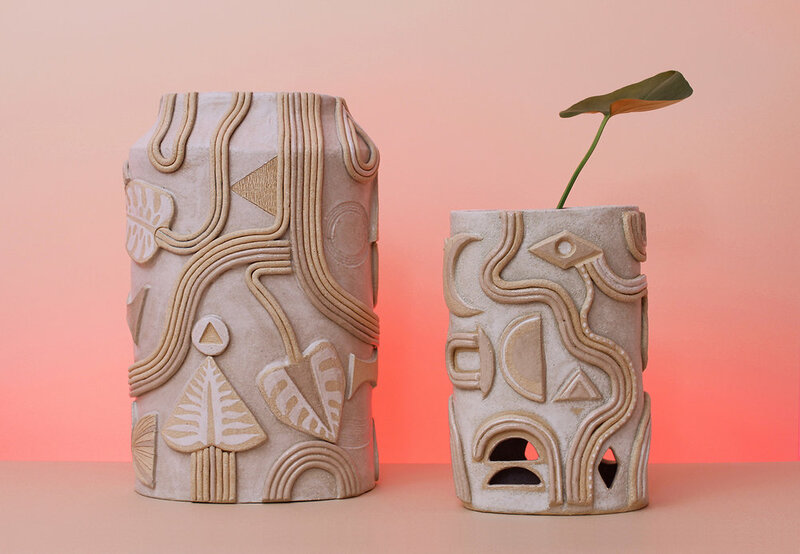 Dust to Dust presents VALA RAE, an exhibition highlighting one-of-a-kind functional ceramic pieces created by Jessie Rose Vala and Emily Rae Counts. VALA RAE is a unique housewares production company that blurs the lines between; art and design, routine and ritual, and functional and fantastical objects. Their work focuses on light and fire, a reflection on the hearth, once the center of the home. 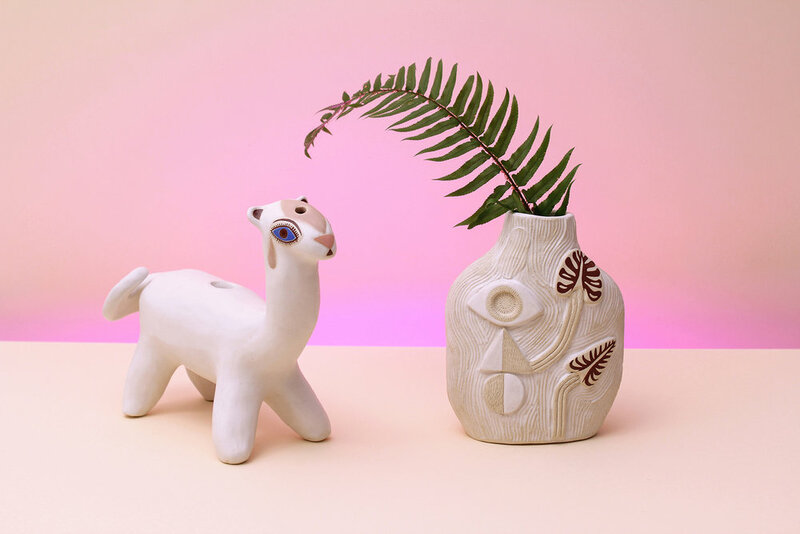 The VALA RAE inaugural exhibition features an oversized lovers’ bong, pendant lights, lamps, chimera-inspired table pipes, cast porcelain pipes, candle holders, and vases. Animal forms and imagery are reflected in these pieces as well as an abundance of patterns, textures, and shapes. This collection of hand sculpted and meticulously glazed objects creates a space where housewares exist in the realms of both the everyday and the wondrous. VALA RAE is guided by art practices, allowing for a fluid generation of objects and ideas. Improvisational actions are relied upon in the creative process as a design for a vase or pipe may inform the shape of a unique table lamp, one idea leading unexpectedly to the next. VALA RAE is a creative collaboration between Jessie Rose Vala and Emily Rae Counts. The intention of VALA RAE is to constantly shift and evolve as a company, to exhibit pieces that are made by Vala and Counts both individually and in tandem, and to build a platform to create work that addresses the convergence of design, art, and craft. VALA RAE objects are born in the Northwest of the United States- a place at the edge of the Ring of Fire where volcanoes, rain and the evergreen trees reign supreme. VALA RAE is inspired by the inner and outer nature of life: crystalline shapes, elemental forces, circular energy, spirits, shadows and sparks. These pieces are to be used, loved, and admired in life and ritual. VALA RAE’s practice builds upon craft and fine art traditions and their experiences as lifelong friends. Emily Counts was born in Seattle, WA, where she currently lives and works. She studied at the Universität der Künste in Berlin and the California College of the Arts, where she received her BFA. Her work has been exhibited in New York at The Museum of Arts and Design and Cooler Gallery, in California at Garboushian Gallery, the Torrance Art Museum, Mark Moore Gallery, and Durden & Ray, in Portland, OR, at Nationale, Carl & Sloan Contemporary, and Disjecta, and in Tokyo at Eitoeiko and Gallery Lara. Counts was an artist in residence creating work for associated solo exhibitions at Raid Projects in Los Angeles and Plane Space in New York. She has received grants from the Oregon Arts Commission, the Regional Arts & Culture Council, and The Ford Family Foundation. She is represented in Oregon by Nationale, in California by Garboushian Gallery and is currently a member of SOIL Gallery in Seattle, Washington. Jessie Rose Vala (born 1977, Madison, Wisconsin) is an American installation artist working in drawing, ceramic, and video. She received an MFA from University of Oregon and a BFA in painting and ceramic sculpture from California College of the Arts in Oakland, California. Her work explores non-linear narratives and environments through an ongoing investigation of the shifting relationships to ourselves and our surroundings. Throughout her work is a questioning of the boundaries between animate and inanimate, the rational and the supernatural, science and spirituality. Installation and multi-channel video allows Vala’s work to negate hierarchy, allowing for multiplicity of connections and realities.